Somewhere, behind closed doors, in her solitary world; somewhere, under the sheets with an indifferent lover; somewhere, is a woman who will not be denied. Trapped for fifteen years in the stranglehold of a dead marriage and soulless household domesticity, the beautiful, full-bodied and passionate Meera Patel depends on her memories and her flights of fancy to soothe the aches that wrack her body; to quieten an unquenchable need. Until one cataclysmic day in Mumbai, when she finally breaks free... Bold, brazen and defiant, Sita’s Curse looks at the hypocrisy of Indian society and tells the compelling story of a middle-class Indian housewife’s urgent need for love, respect, acceptance and sexual fulfillment. Sreemoyee Piu Kundu is an ex Lifestyle Editor and former PR head, and now a full time novelist based in Delhi. Her next two releases are You've Got The Wrong Girl (Hachette) and Cut!. Sreemoyee is planning her fifth novel, a political tragedy, Rahula. The story is about Meera, her life and thoughts. She is bold and desirable. She is beautiful and sensual. She pines for love and demands only one thing from life; somebody who loves her. Her life is a tragedy. Mohan knows his limitations. He is loving and caring as a person. But, fails as a husband. To begin with, the cover page is perfect. It gives a sensuous yet subtle hint of what can be expected in the book. The book blurb further describes more about the plot. And, the first few pages ensures that whatever was promised is delivered. The best things about the book is the narrative. Sreemoye’s words flow with ease, like free water. It sounds effortless and believable. Further, I appreciate the author for venturing into a less forayed genre – erotica. The story is not only bold (all the time), but also very realistic (many a times). The loneliness, the desire to be loved, the plight of womanhood and the way their dreams are bottled in the name of marriage are well handled and established. I generally like to read biopic-like fictions. 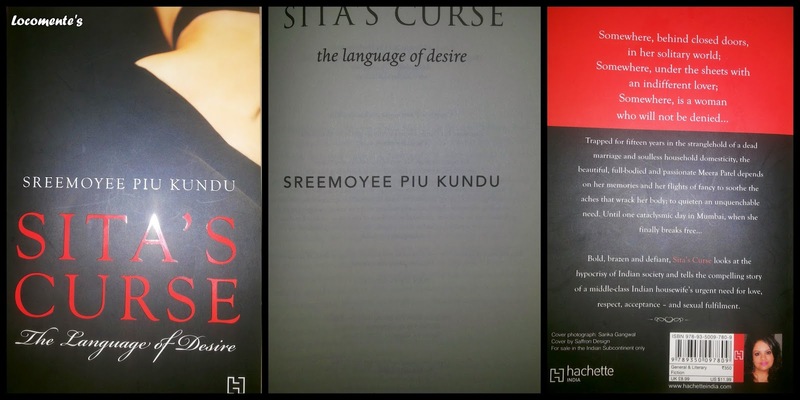 Sita’s Curse is one such book which takes us through the Meera’s life from childhood. It makes her more real and as readers, we are able to empathize with her. The first person narrative adds to the charm. The story slowly unravels the transformation of a little girl into a dreamy teenager and then into a middle-aged woman who understands the mysteries of life. The story matures with Meera, so does the narrative. I appreciate the way in which the author relates the title of the book with the plot. It makes us think if Sita’s life was indeed a curse. It makes us wonder if Sita was ever happy as a woman. In short, the book is an assured page-turner owing to the author’s narrative style. Most of the times, the book is too bold to digest. Some situations makes you flinch and lets you wonder if people can be like that. Also, the raw narrative, at times, becomes a little too much; more so towards the end. The book belongs to erotica genre. Hence, the book focuses only on the physical needs of Meera with a subtle and implicit hints to establish that she pines to be loved. It would have brilliant if the author covered other aspects of her needs and plights too. That would have turned this book into a perfect one. Go for it if you are comfortable to read erotica. You can also go for it for the sheer experience this offers.